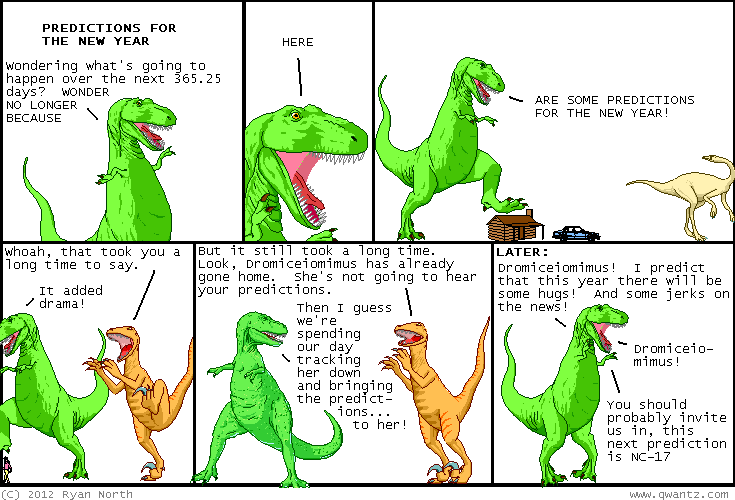 Dinosaur Comics - January 2nd, 2012 - awesome fun times! –One way to find out! January 2nd, 2012: Scroll allllll the way down (on the non-mobile site) and you'll see my new winter footer, done (as usual) by Danielle! She also made my bike helmet, which you can see by clicking on her name. This one shows a SNOWBALL FIGHT, and I would be pelting Joey Comeau if only it'd snow in Toronto. I hope you enjoyed the Klassic Komics last week! They're all back to their usual URLs, but to see them again here's the comic on Monday and Tuesday and Wednesday and Thursday and Friday.